Jason Micheal “Big Mac” McCullough, age 34 of Marion, passed away on Thursday, September 27, 2018 at the Marion General Hospital. Jason entered into this world on February 28, 1984 to Kevin E. and Kathy (DeWees) McCullough in Marion, OH. Jason worked for the Whirlpool Corporation. 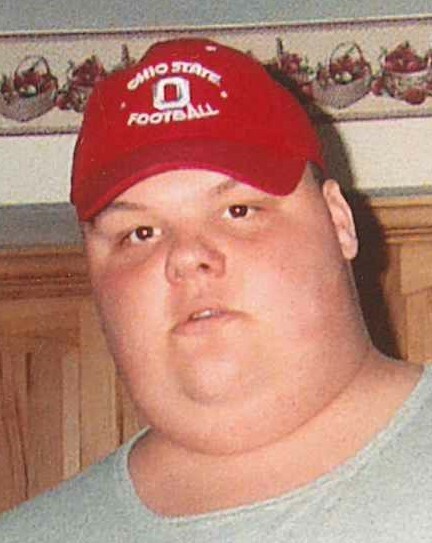 Jason was an avid Ohio State Buckeye and Cleveland Browns fan. He always hoped this would be the year for both teams to win. Jason also loved playing video games and playing with his nieces and nephews on his off time. He will truly be missed by his family and friends. Jason was preceded in death by his father: Kevin E. McCullough; his grandparents: Mary Cannode, Betty and Marion DeWees. Family who will cherish his memories are his mother: Kathy McCullough of Marion, OH; his sisters: Christy (Peg Romine) Utley of Marion, OH, Jennifer McCullough of Marion, OH and Tiffany McCullough of Ashland, OH; his brother: David Watson of Marion, OH; his grandmother: Maryellen Bumgarner; his niece: Jenna Bollinger; his nephews: Jayce Bollinger, Jason McFarland, Jacob Kinney, Ryan DeWees, and Joshua Utley; and his aunts, uncles, cousins, and friends. Friends and family may come to honor Jason on Wednesday October 3, 2018 from 6pm to 8pm at the Boyd-Born Funeral Home. A funeral service will be held on Thursday October 4, 2018 starting at 11am at the funeral home with Pastor Russell Howard officiating. Burial will follow service at the Otterbein Cemetery in Mt. Victory, OH. Donations may be given in care of the Boyd-Born Funeral Home to go towards funeral expenses. Online condolences may be expressed to the family at: www.boydbornfuneralhome.com.